Also published as "Little Steel Coils"
Lucy Holmes walks into the office of a detective, looking beautiful and distressed. Quickly she unfolds her tale of woe: her husband went away on a business trip. After a week, he sent her a note saying he would be back the next day. But the morning he was to return, Lucy woke to find a newspaper article saying her husband had died--two days before he sent her the note! A difficult problem indeed. 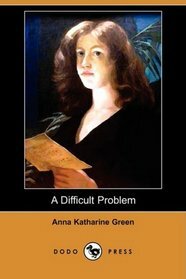 A Difficult Problem is another weird story from Anna Katharine Green. Why do I keep downloading this woman's stories? Although to be fair, A Difficult Problem is much better than Midnight on Beauchamp Row (review here). And by better I mean it makes slightly more sense. Kinda. The beginning is pretty fun because it feels like a hard-boiled detective novel à la Dashiell Hammett: the seemingly-innocent woman in distress; the detective (who is never identified), slightly skeptical but drawn in despite his own reservations. It turns out Lucy is keeping pertinent information from him, but not because she's up to no good--it's because she's a TOTAL AIRHEAD. She's like, "Oh my poor husband, I--squirrel!" Once the detective talks her through things ("Focus, Lucy, focus! Good girl!") the solution to the mystery is pretty obvious. The problem the detective has then is how to prove it. THE SPIRALS, THE OMINOUS SPIRALS. This is where things get weird. He chases the suspect all over New York City convincing people to drop springs into the poor guy's soup, and the suspect--who appears to be a homeless person--really starts spazzing out, even trying to kill himself. It's like How to Catch a Killer Using the Methods of Edgar Allan Poe. Death by spiral! Dude! Anyway, the ending is really silly and unsatisfying. I hated Lucy and had more sympathy for the killer. Is it just me or does it seem like Green picks on the outcasts of society? "Oh, naturally he's the killer, he's a poorly-groomed homeless person." REALLY?! Shallow much? A Difficult Problem is sort of a love-gone-wrong tale, except without the conclusion of the one who did wrong getting their just desserts, which is the only reason to read such stories. But on the plus side it didn't take very long to read.